Indian Hawthorn is a beautiful choice for hot, dry, sunny locations with appealing features through all the seasons. The glossy, evergreen foliage looks great year-round and is a welcome sight in the winter landscape. 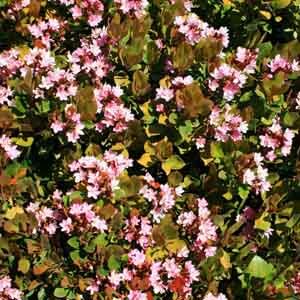 Delicately fragrant, star-like flowers appear in the spring and are followed by purplish-black, round berries in early autumn. The fruit is attractive and also provides a nutritious treat for a variety of birds. Looks beautiful in the garden as a specimen or clipped hedge. Beautiful grouped or massed in a shrub border. Excellent for planting along fences and walls. Very easy to grow in virtually any location. Plant in a reliably sunny spot. Best in fertile, well-drained soil. Water regularly until established. Prune or trim after plant has bloomed.